THE BRITISH RAILWAY STORIES LTD: "Hornby Thompson O1: A must buy before you die"
For modellers of the ex-London & North Eastern Railway lines, it could be reasonably argued that all of our Christmases have come at once over the last few years. 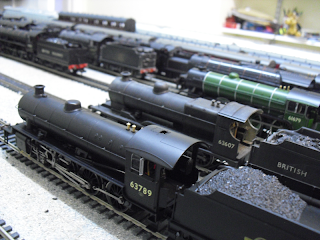 We've had the Hornby L1, B1 and B17 recently, along with a whole host of superb Gresley and Thompson suburban stock. 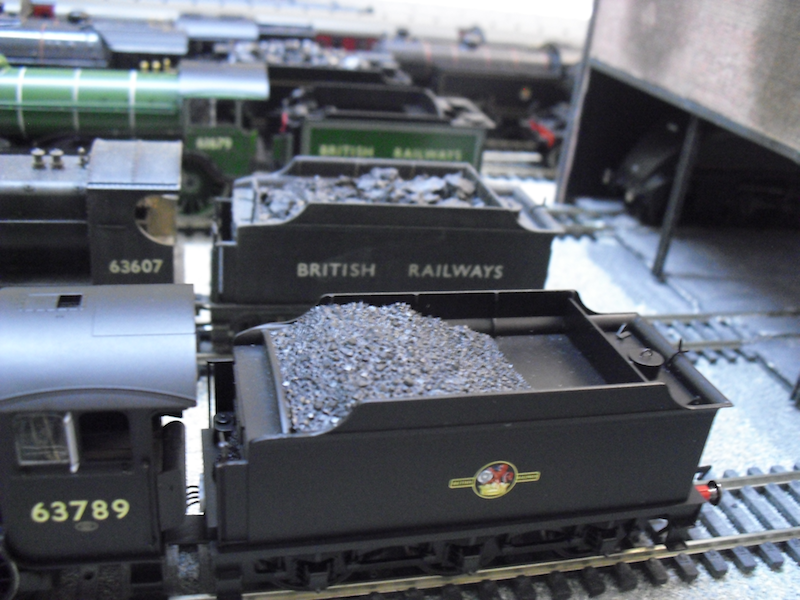 There's been wagons and vans galore from Bachmann, as well as their O4, A2 and D11 with a J11 on the way. Not forgetting, of course, the standard fare in the form of Hornby's superb A3 and A4 models, and Bachmann's rugged and powerful Peppercorn A1. Aside from the O4 from Bachmann, the ex-LNER lines have looked a little empty in terms of freight locomotives. That is all set to change over the next few years, with the introduction of this, the Hornby Thompson O1, and Heljan's forthcoming Gresley O2. It is truly an exciting time to be an LNER modeller. We'll focus on the here and now for the time being. 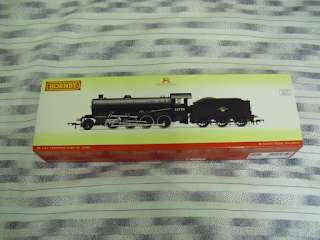 A sample of Hornby's Thompson O1 was kindly loaned to me for review, in lieu of my own arriving in time for Christmas. 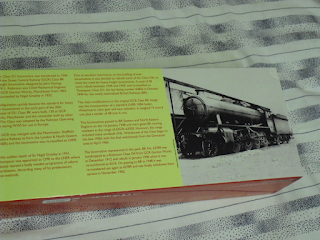 One of the things I recently praised Hornby for was their new box design (see my B17 review, here) but one thing I neglected to mention was the excellent locomotive history, with photograph, that they have put onto the back of recent releases. It adds an extra dimension to the whole model I feel, and the "event" of removing it from its packaging. 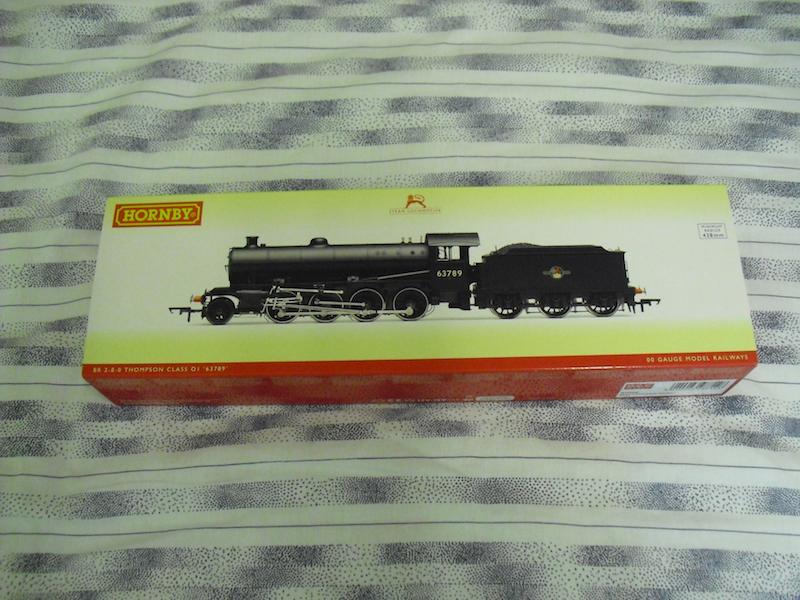 I can say with certainty that Hornby's O1 is one of the best looking model locomotives I have seen for years. 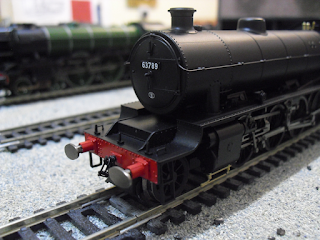 It nails the character of the prototype with very well defined and well moulded rivet detail on the frames and boiler. Dimensionally, it closely matches Isinglass' 4mm drawings. There is one detail puzzling me at present. 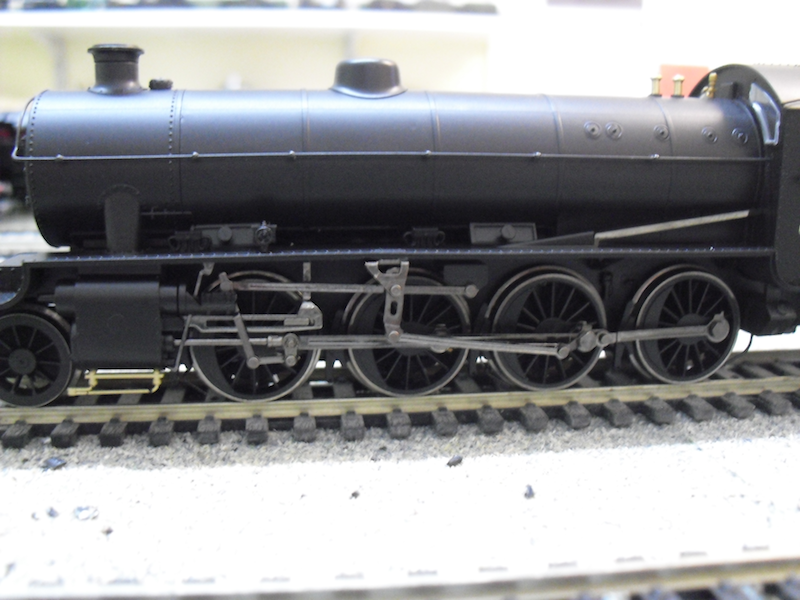 Hornby's model has buffers which have hexagonal shanks. I cannot as yet find a photograph of the prototype with such buffers. They should be, as far as I can see, tube shaped. Otherwise, the bufferheads are very nice, and Hornby appears to have designed a way of keeping these oval buffers level, with no swiveling. A very nice job but with a slight question mark over the buffer shanks. 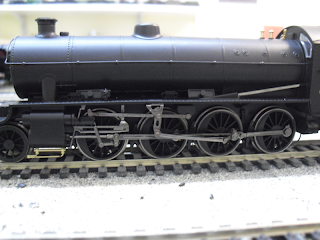 The valve gear on the prototype closely matched that of Thompson's B1, and so it is here that Hornby's O1 closely matches its B1 shedmate in this area. The valve gear really is a thing of beauty in operation. 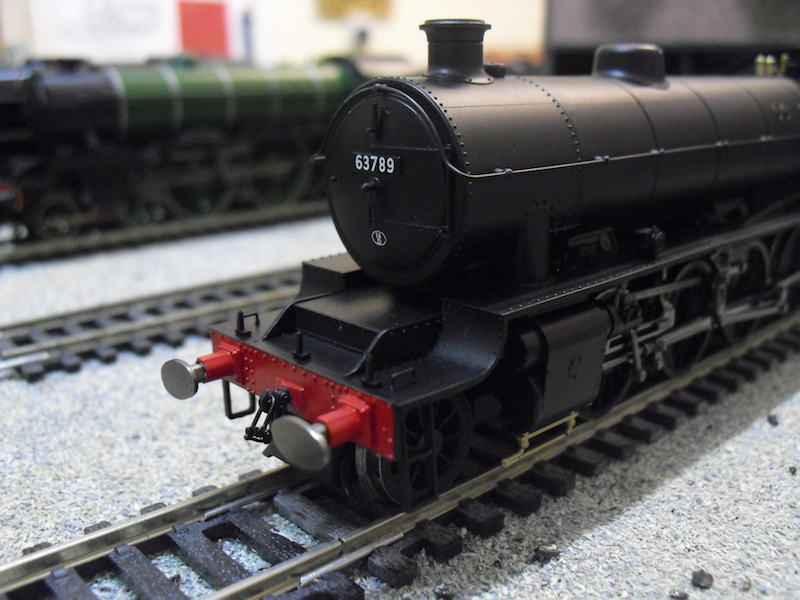 One thing to note: Hornby's model comes with the cylinder draincocks ready fitted. This may be a first on a ready to run model, and I have to be honest when I say that the relief was palpable when I realized that I wasn't going to have to touch the cylinders! The "face" of the locomotive, the smokebox door, matches closely a specific type carried by members of the class (including 63789) however a fair comment has been made on a few internet forums that the more common type, resembling closely North Eastern Railway smokebox doors, would have been a better choice. In order to change the smokebox door type, you have to file away Hornby's excellent rendition, which is a shame. Keep the lamp iron and the door dart handy though for fitting to your replacement door! The alternative is to pick a number which corresponds to a member of the class with this type of door. The livery (though very basic in plain, unlined black) is well applied, with numerals and lettering very clear and readable as it always is. That said, looking at the British Railways crest on this model, and comparing it to one of my older Hornby A4s, I am astounded to find that the printing is so much more crisp and sharp, and colourful than it has been previously. It is a significant step up. The interior backhead is absolutely stunning. No other word for it. This may be the most well detailed cab interior of any freight locomotive produced ready to run, with the possible exception of Bachmann's recently released Southern Railway C Class, or their own O4 model. Speaking of which, now seems like a good time to reintroduce an old friend. 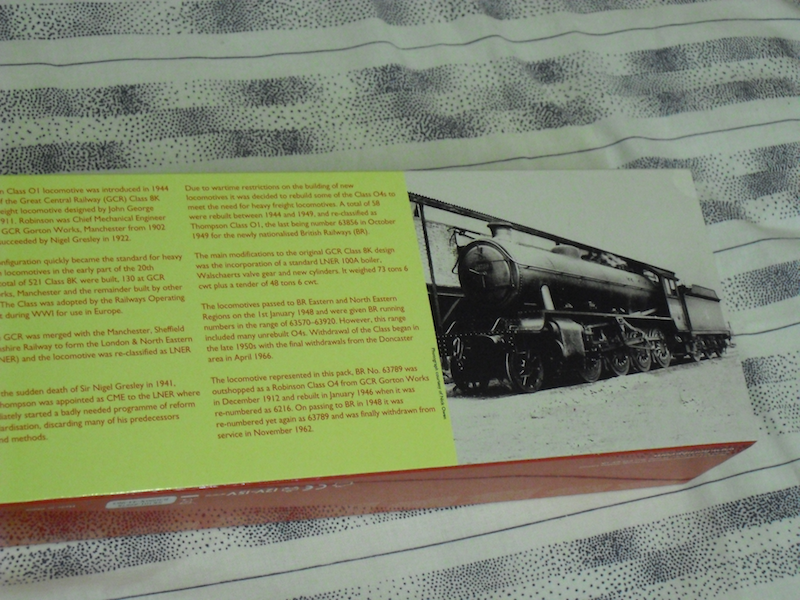 Here's 63607, which was a purchase last year that I have not come to regret. 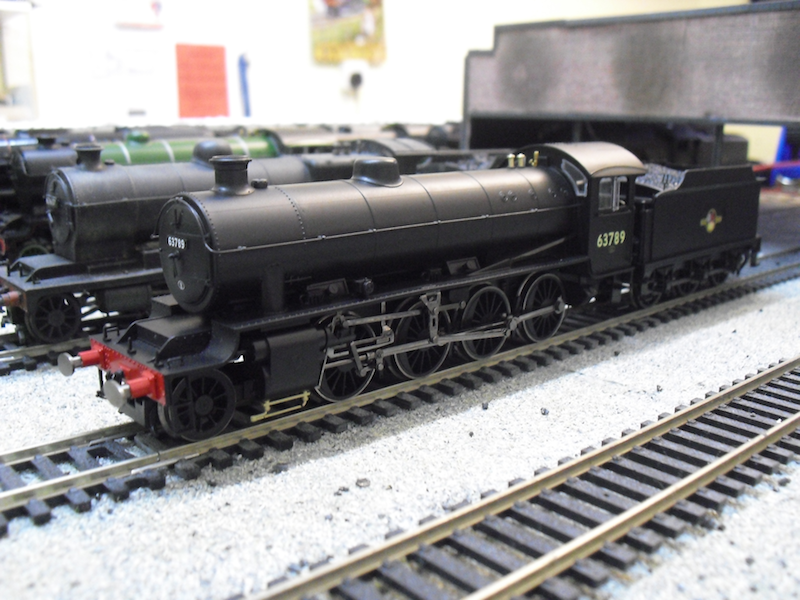 Bachmann's Robinson O4 model is a model of the locomotive class from which Thompson built his 54 O1 locomotives, as and when the boilers came up for repair. It's a great model, with only two minor problems. The first is the lip over the cylinders on the running plate, which is incorrect. It's much more subtle on the real thing. The second is the cylinder's angle compared to the running plate. We are talking a few degrees out. It's simply a non-issue in my opinion, but it remains "incorrect". Lots of people on various internet flora and fauna have wrung their hands and lamented Bachmann not doing the O1 instead, but a glance at the modifications that would have been needed to Bachmann's O4 tooling to sort out the cylinder placement in particular, precluded that from ever happening I think. What is much more likely is that we'll see a Thompson O4/8 (an O4 but with the standard 100A boiler and a new cab) released in future. So, were these people right? Should Bachmann have done the O1 instead? I don't think so. My reasons for thinking this lie mostly with the tender and the overall "fineness" of the two models. The Hornby model has the edge in every way. The Great Central Railway tender - of which Hornby have duplicated Bachmann's type, is extremely fine in detail, and just better looking than Bachmann's. I say "just" - Bachmann's looks coarser by comparison, but it would be unfair to describe it as "coarse". It's still an excellent rendition of the tender, albeit superseded by the extremely high standard Hornby have set with theirs. Turning our attention to the locomotives, obviously they are not entirely comparable, being two different classes bar the shared wheelbase and pony truck in reality. In addition, the models are completely different in terms of their manufacturing philosophy. Hornby's utilizes a heavy diecast chassis, with an all plastic bodyshell made from lots of separately fitted parts. Bachmann's utilizes a diecast chassis too, but the running plate on the O4 is also diecast metal, and adds to the heaviness of the latter. The more spartan look of the O4 (as it is with the prototype) does make the Hornby, by comparison, look very much more detailed. This is not to say the Bachmann O4 isn't quite up to the standards of the O1 (far from it), but in my view the Hornby O1 edges out in front because the overall fineness of the mouldings and separately fitted detail, makes this a package of indisputable high quality. If you need something to gauge the fineness by, look at the washout plugs on both locomotives. Hornby's are incredible. Or try looking at the rivet detail. I'm not saying count them, but look at them. Hornby have nailed the "prominently raised but subtly positioned" aspect of the real thing's rivets. Turning to its operation, the sample received for review was tested on my rolling road, and frankly was the smoothest operator I've ever had on it. Better than some Heljan diesels. Praise indeed! It wasn't until I turned the model over to fit the brake gear for my friend, that I realized this was the DCC fitted O1 model (it says so in white lettering underneath "DCC Fitted"). This required an extra test, for which I dug out my trusty Bachmann Dynamis system. 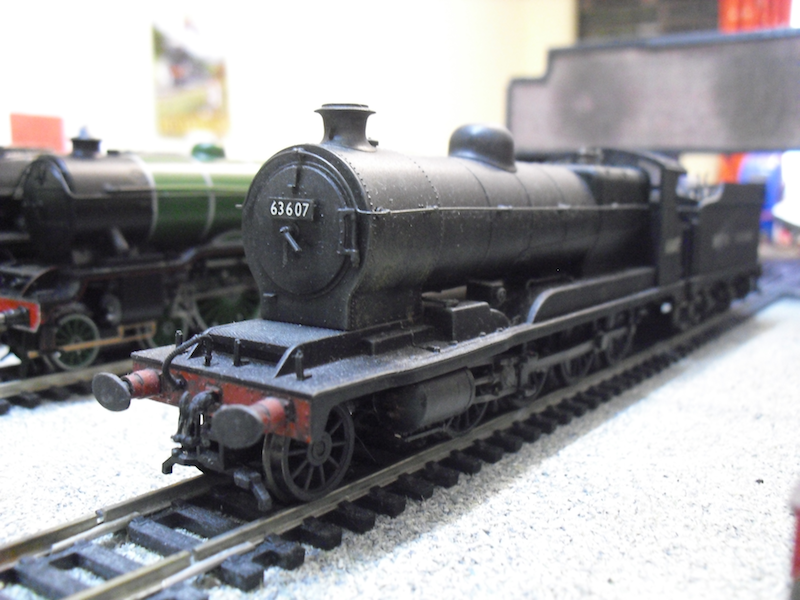 On the rolling road, Hornby's O1 was even smoother under DCC control. I simply can't express how good it was. I've no idea what the scale speed was, but I left the controller at its minimum throttle power and could barely see the driving wheels moving. They were, however, still moving. It was amazing. It was smooth through all the power ranges. I wasn't finished with the model yet. I had to go and test it pulling a train. I rang up a friend and asked to use his trainset to test it. He's a Midland Region modeller, and turned his nose up at the thought of "that a***hole Edward Thompson" having one of his prototypes running on HIS trainset. I calmed him down and persuaded him to let me test it on his heaviest train, which includes brass coaches, and weighs around 3500-3700g. This was not all on the level either, with a particularly awkward reverse curve on a gradient, and two sets of spirals to deal with, but the Thompson O1 had no problems at all. It just romped away with the crimson set of coaches. The only snag I could find was that going through particularly tight curvature (around second to first radius at times, bearing in mind the model is only designed for second radius and above!) or tricky pointwork, with the steps attached at the front end, the pony truck threatened to derail, but never did. As far as chassis go, this must rank as one of the best. No, the best. The absolute best chassis under any steam outline locomotive I've ever come across. I've never come across, in particular, another 2-8-0 that has run quite so well. Bachmann's O4 is also a very, very smooth operator, and up until today I'd have said that was one the smoothest running model freight locomotive on sale today. But Hornby's O1 is that much more smooth, it's almost unbelievable. It's a bit like listening to the best of Barry White, through the highest quality sound system, next to the Mediterranean sea in the hot sun, whilst eating the most luxurious Belgian chocolates. You don't think it can get any better, any smoother, and then BAM, Scarlett Johansson turns up to serve you cocktails. The Hornby Thompson O1 is that moment. It's a model so far and away better than anything else on the market for this type of locomotive, that you really don't think it can be bettered. If you think I'm overstating the quality of this model, I suggest you go out and find someone who has one and ask them what they think. For my money, this is the best steam outline locomotive model on sale right now. There's an incredible amount of finesse, a brilliantly smooth chassis, and a sheer presence that no other model quite has. 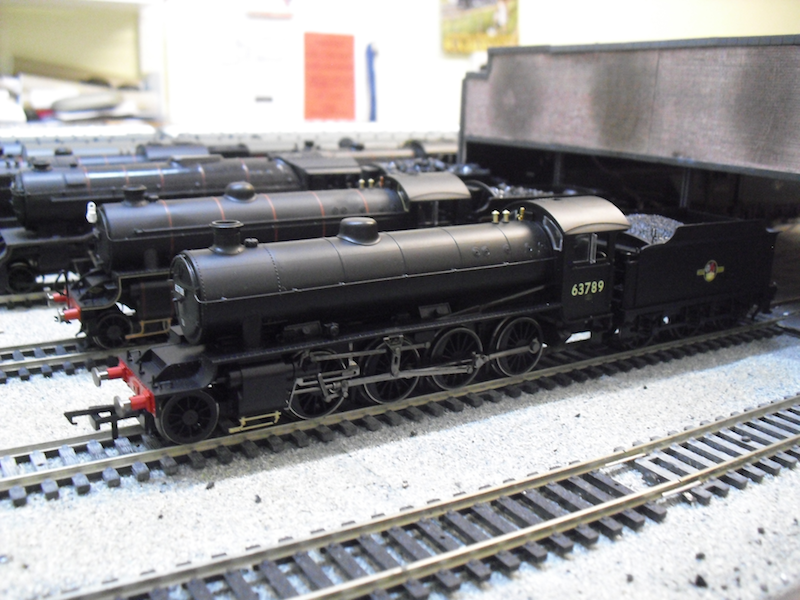 I said in my B17 review that I felt the Hornby L1 was the only "perfect" model Hornby has produced of their recent L1, B1 and B17 models out at the time. Bringing the Thompson O1 into the mix, I have to eat my words. The Thompson O1 is the perfect model. It's the dictionary definition of a "perfect model". A year ago I threatened to have a bit of a wobbly moment with Hornby. I was hugely disappointed with their Network South East 4VEP model. It simply wasn't good enough in a lot of areas, with lots of unforced errors and manufacturing problems rearing their head. 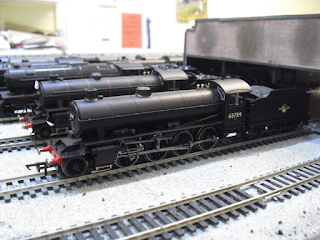 At the same time, Hornby's B1 came out and you had to ask if it was a case of Jekyll & Hyde. The B1 was brilliant, the 4VEP awkward and severely flawed. Hornby have had their problems with manufacturing slots and delivery over the past few years, however their 2013 release program has promised to rectify this. The O1, in fact, is a positive recipient of this desire to fix any and all issues, arriving in time for Christmas 2012 quite nicely. 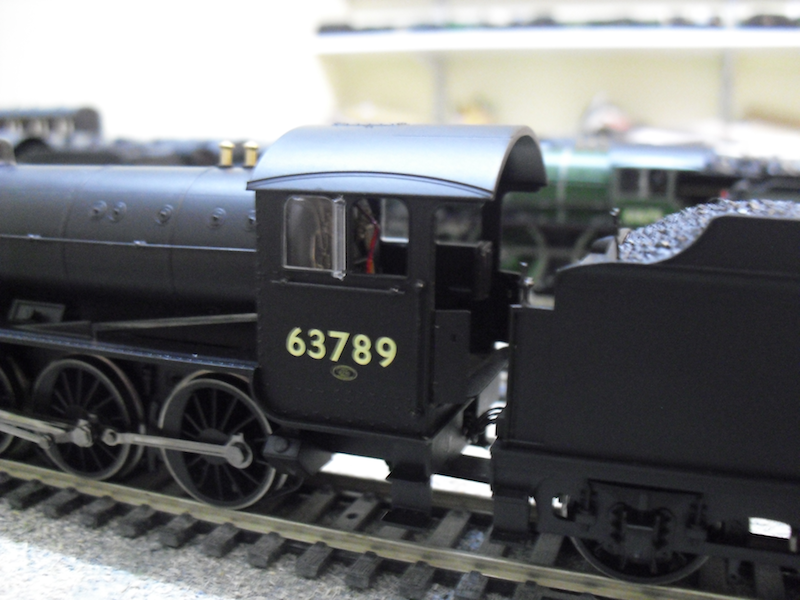 The Thompson O1 is Hornby at the top of their game. It's an absolute winner in my books, unlikely to be bettered any time soon and sitting at the top of the ready to run market. If Hornby can continue this excellent run of form (L1, B1, B17 and O1) then I can't see how they can possibly fail. 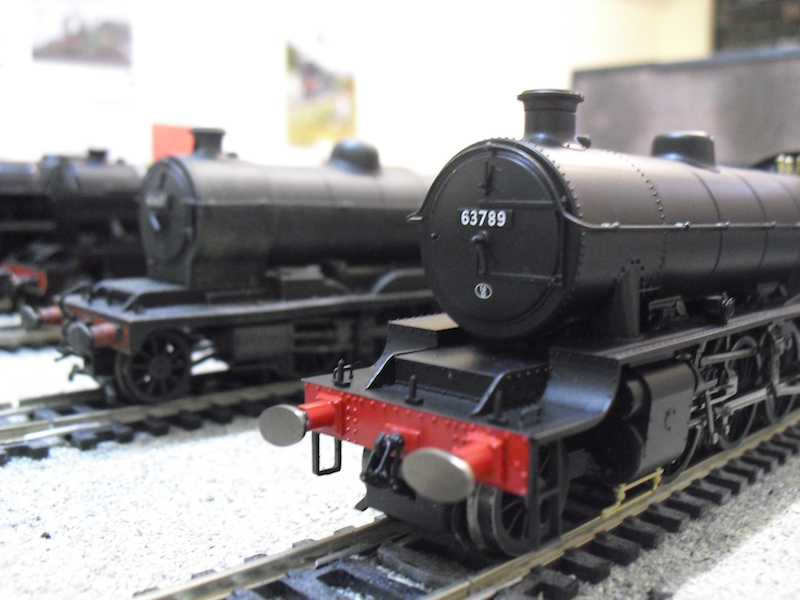 I can only hope that the main range Gresley P2 from Hornby next year will be as much a show stealer then, as the Thompson O1 is to me right now. I really cannot recommend this model enough except to say it's a must have. A "must buy before you die". The Hornby L1 was an excellent model, the B1 was highly recommended, the B17 was a "very nice to have" with a few unforced livery errors, but this - THIS is one of the models you have to own before you die, if you model the London & North Eastern railway or its regions under British Railways. It's that good! Which is why I am currently holding it to ransom from its owner until my own Hornby O1 turns up. It's too good to let go of yet!